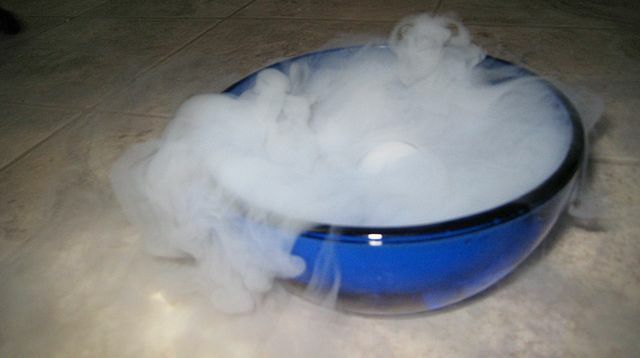 Dry ice is simply frozen carbon dioxide, the stuff that we breathe out with every breath. It is a common part of the earth’s atmosphere and is used by plants in photosynthesis. It is the stuff added to water to make soda water and is very useful for freezing things due to its frozen temperature: -109.3°F or -78.5°C. Before it can be used, the carbon dioxide needs to be transformed into dry ice. This is done by compressing the gas to turn it into a liquid. It is then passed through a valve that causes part of it to freeze into snowflakes. The snow is then compacted into large blocks. These blocks are a lot heavier than a comparative block of frozen water would be and weight about the same as a standard brick. Once the dry ice is made into blocks, it can then be put to use. Some of the many uses of it include as a food preservative, transporting medical items, crating fog for special effects and cooling a variety of items. It is also used in several trades for example to freeze water pipes to allow emergency plumping repairs or to shrink metal parts to lift floors tiles. It is really effective because it removes around twice as much heat as water ice does and goes from a solid to a gas, missing out the liquid state in the middle, meaning there is no clean-up involved. This is especially useful in food preparation and transportation purposes as there aren’t pools of water building up everywhere. It is important in preventing the growth of salmonella as well as stopping moisture building up during shipment. It must always be remembered when dealing with dry ice that it is extremely cold and can cause cold burns, so gloves should always be worn. It is also important that it is used in correctly ventilated areas and should be kept away from pets and children. The question of how long does dry ice lasts does depend somewhat on the purpose it is being used for. As a general rule, it will last for 18-24 hours in a cooler or ice chest, 3-5 hours outside and 15-45 minutes when reduced to a liquid form. If you are storing it in a cooler, make sure it is not an airtight one as when the ice melts, the gases could cause the cooler to burst! Also, remember to keep the correct ventilation around the storage area. As mentioned, never touch the dry ice with your bare skin as it will burn. Similarly, never drink dry ice. At Halloween, a popular use is to put into glasses of liquid for the effect but these are decorative and are not to be drank. Consuming it will lead to nasty burns in your throat and a trip to the hospital. Finally, if you are around dry ice and experience any difficulty breathing – get away from it. Occasionally it does create problems for some people, especially with respiratory problems, so at the first sign of problems, remove yourself from the vicinity. Next post: What is Chef School?